It’s not a good idea to put all your eggs in one basket. That’s especially true when you’re saving for retirement. Putting all your assets into bonds — or worse, that hot new tech IPO — can cause big headaches down the line. And don’t even think about relying solely on Social Security! Instead, try one of the best strategies for building retirement wealth: building a broad portfolio of stocks across different industries and investment styles. Try for a mix of growth stocks and value stocks. Here are three great choices to include in a diversified portfolio: oil major Royal Dutch Shell (NYSE:RDS-A) (NYSE:RDS-B), robotic vacuum manufacturer iRobot (NASDAQ:IRBT), and the nation’s biggest trash hauler and landfill operator, Waste Management (NYSE:WM). A diversified portfolio can help you live the way you want to in retirement. Image source: Getty Images. It’s tough to argue against including Royal Dutch Shell in a diversified portfolio. The big oil behemoth sports a best-in-class dividend, currently yielding about 5.9%. But the best part about Shell is how it’s managed to outperform in both good times and bad. The good times have been rolling for Shell recently. In Q3 and Q4 2018, it churned out operating cash flow of $12.1 billion and $22.0 billion, respectively. Even accounting for a change in working capital, Q4’s operating cash flow was still a decade-high $12.9 billion. That’s particularly impressive considering oil prices fell by 40% in Q4. Luckily, gas prices moved higher, allowing Shell to make up the difference. Shell has taken advantage of this cash flow bonanza to buy back shares, benefiting investors. And even when times are tough for both oil and gas prices, like during the oil price slump of 2014-2017, Shell has been investor-friendly, refusing to cut its dividend. Right now, Shell’s P/E ratio of 11.4 is lower than those of peers like BP and ExxonMobil, making it a good value as well as an excellent outperformer. You’ve probably heard of the Roomba robotic vacuum. In fact, the word “Roomba” has started to become synonymous with “robotic vacuum,” but — as the company’s commercials have begun pointing out — “Roomba” is a brand name that refers only to vacuums made by robotic vacuum pioneer iRobot. iRobot has been growing by leaps and bounds. Revenue is up 108.9% over the last five years. Profits have soared 174.5%. And the share price has grown, too, jumping 161.7% over the same time period. And thanks to a growing market that is ripe for tapping, and opportunities it’s pursuing with smart-home technology manufacturers like Amazon and Alphabet‘s Google, the company seems likely to continue to grow. Although iRobot is the undisputed leader in the robotic vacuum market, with 62% of global market share, robotic vacuums occupy a small niche in the overall global vacuum market. Even in the world of high-end vacuums, robotic vacuums only make up 23% of the market. That means there’s a lot of room for iRobot to grow its market share. iRobot has partnered with Amazon to allow its newest Roombas to be voice-activated through Amazon Echo smart speakers. As smart-home technology becomes more widespread, it’s a huge opportunity to grow the robotic device market, and iRobot is already leading the charge. Royal Dutch Shell’s stock has lagged the market for the last five years, and looks like a value today. Meanwhile, iRobot and Waste Management have logged market-beating growth. Chart from YCharts. 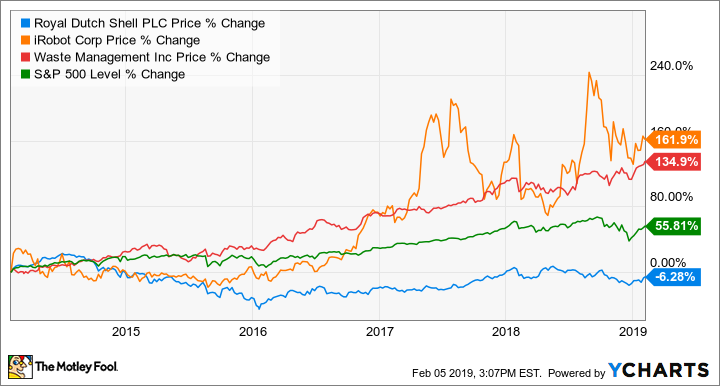 You might not think of a $41 billion company as being much of a “growth stock,” but trash hauler and landfill operator Waste Management has grown its market cap by 115% over the past five years. And it’s done it the old-fashioned way: by hauling and landfilling more trash, and gradually charging customers more to do it. An investment in Waste Management makes sense from a value perspective: There will always be trash to haul. Plus, because landfills represent major investments of both money and space (and government paperwork, of course! ), and because economies of scale apply, Waste Management has a wide competitive moat. The company pays a stable dividend that yields 1.9% at the stock’s recent price and has increased the dividend every year for a decade. And its P/E ratio of 18.4 is lower than those of smaller peers like Republic Services and Waste Connections. As the population grows, there will be more trash for Waste Management to haul, and more materials for it to recycle, which means the company makes sense from a growth perspective as well. In the most recently reported quarter (Q3 2018), earnings per share soared 40.2% higher year over year, which is impressive for any company, let alone one in a relatively dull industry. As you’re looking to build your retirement portfolio with a mix of outperforming stocks, consider allocating some space to Royal Dutch Shell, iRobot, and Waste Management. Although they’re three very different companies, put together, they make for a compellingly diverse basket of stocks for the long haul. John Mackey, CEO of Whole Foods Market, an Amazon subsidiary, is a member of The Motley Fool’s board of directors. Suzanne Frey, an executive at Alphabet, is a member of The Motley Fool’s board of directors. John Bromels owns shares of GOOGL, GOOG, AMZN, BP, iRobot, and Waste Management. The Motley Fool owns shares of and recommends GOOGL, GOOG, AMZN, and iRobot. The Motley Fool has a disclosure policy.